Florida Governor Rick Scott has stated that Hurricane Michael is forecast to be the most destructive storm to hit the Florida panhandle in decades. 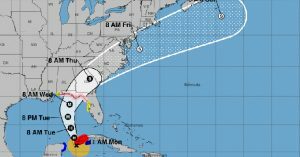 Now a powerful Category 2 storm and just shy or a Category 3, Michael is poised to strike between Destin and Tallahassee by Wednesday morning and continue up the east coast and mid-Atlantic. As mandatory evacuations are underway, residents of the areas in the storm’s path are urged to take heed. As the intensifying storm approaches, Cajun Navy Foundation volunteers are busy organizing their resources and preparing for the many requests that will be coming in. CNF dispatch volunteers are ready for action as Michael advances. They are urging people under evacuation orders to do so before the waters start rising. For those who want to leave, CNF’s team is ready and willing to help with evacuations, not just rescues. For those who are reluctant to leave because they own pets, CNF has numerous resources to help with any pet needs they may have. Experience has taught these dispatchers first-hand what it’s like to hear from a family who is trapped in their attic. They have had the daunting task of instructing people who refuse to evacuate to write their social security numbers on their arms, and of asking for contact information for next of kin. These volunteers know what it’s like to tell a father that they can’t get to his child until the winds die down. No one wants to be on either end of situations like these. CNF volunteers collaborate as a well-organized, highly trained team of individuals who come together like a finely tuned machine. The group’s citizen-led efforts operate under a central command that helps maintain effective communication. Training new dispatch team members is also a priority, ensuring that boots on the ground are safe and being deployed according to their location on the map. Closely monitoring the Zello channel empowers dispatchers to make sure anyone reaching out is addressed right away. They are charged with the challenge of deciphering which needs are most emergent. Dispatchers are often a source of strength for their boots on the ground and for the people in the storm, as well. CNF Dispatch is faced with the chore of confirming that all information is correct and verified, that addresses are being kept private, and that only vetted rescuers are working to assist those in need. To help CNF carry out their mission, those in need and those who want to volunteer are asked to connect with them on crowdrelief.net.